My Roof Does Not Have A Fascia Board - How Do I Support The Gutter? Do I Need A Fascia Bracket On Either Side Of A Fitting? How Far Apart Should Fascia Brackets Be Fixed? My Roof Does Not Have A Fascia Board - How Do I Support The Gutter? Do I Need To Use Silicon Sealant On Normal PVC Gutter Joints? How Does The Downpipe Connect To The Guttering? How Do I Connect My Downpipes To The Underground Drainage? How Far Into The Gutter Should Roof Tiles Project? Stopends - External Or Internal? What Are The Dimensions Of Your Hoppers? Which Gutter Adaptor Do I Need? Many older properties were designed with either open eaves (no fascia board) or with a sloping fascia board. This means that it is impossible to use a standard fascia bracket to support the gutter. There are however a variety of other options. 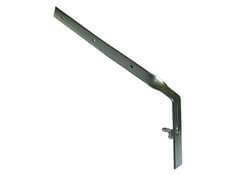 Side rafter brackets are the most popular. These are galvanised metal arms that are fixed to the side of the rafter at the bottom end of the rafter. A standard fascia bracket (purchased separately) is then connected to the front plate of the rafter arm using the nut and bolt provided. The nut and bolt can be slid up and down prior to final tightening to ensure that the correct fall is achieved. Top Rafter brackets work on exactly the same principle, but instead of fixing to the side of the rafter they are screwed onto the top of the timber. This means that unless it is a new build project, the bottom couple of courses of tiles or slates will need to be removed prior to installation. The other option (if the design of the building allows) is to use a Rise and Fall bracket. The bracket is essentially a metal arm that is driven (or more usually mortared) into the brickwork at the eaves. 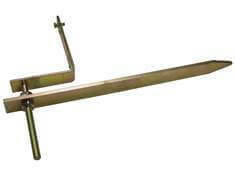 A second angle section is then adjusted up or down using locknuts on a threaded bar. 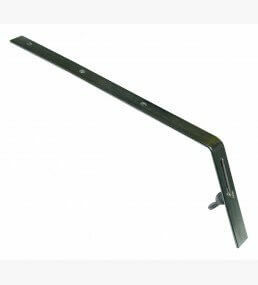 A standard fascia bracket (purchased separately) is then fixed to this angle section using the wing nut and bolt (supplied). How Far Apart Should Fascia Brackets Be Fixed? Do I Need To Use Silicon Sealant On Normal PVC Gutter Joints?